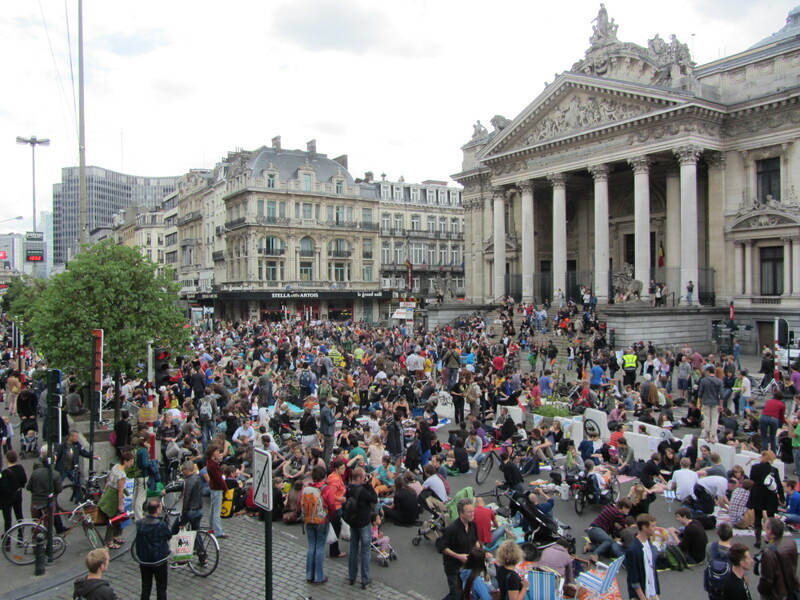 At least 2,000 residents of Brussels took to the streets last Sunday to demand more room for pedestrians and cyclists in the city center. With a picnic on one of the central avenues, they blocked car traffic for a couple of hours. The open space in front of the Stock Exchange, right in the heart of Brussels, is officially called a square (plein or place). In reality, people only have a sidewalk a bit wider than average to stroll beside a four-lane thoroughfare that bisects the city center north to south. The "square" is usually unpleasant because of car exhaust and engine roars. Last Sunday at noon, however, residents — mostly families — invaded the public space with a picnic. "We want to give the city back to the people," said a young woman from her deckchair. 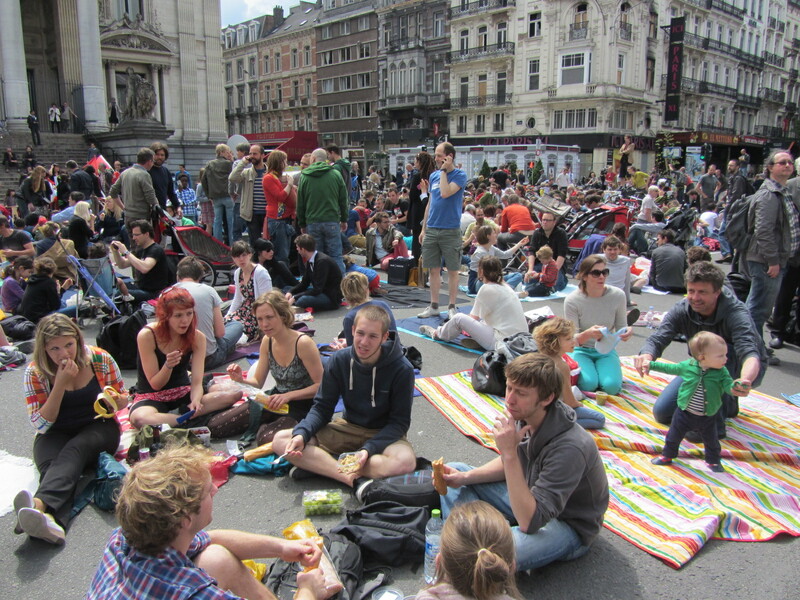 The idea for the picnic was kick-started by Philippe Van Parijs, a philosophy professor connected to the universities of Louvain-La-Neuve and Oxford, who published an opinion piece in several local media outlets. "It will suffice to explain politely to motorists that for once is not for them to impose their rule," Van Parijs wrote. "To shake off an irresponsible lethargy, a bit of gentle civil disobedience is more than legitimate." The organizers want to make the picnic into a regular event to keep pressure on the city authorities. Freddy Thielemans, who has been the mayor of Brussels for almost 12 years, has a history of not living up to promises when it comes to reorganizing public space to reduce motorized traffic. A 2004 plan to drastically diminish traffic on central avenues has not resulted in significant changes. The idea to hold a picnic did not come out of the blue. In the early 1970s, a similar event helped to ban cars from the Grand Place, the historic town square two blocks from the Stock Exchange. Laurent Vermeersch is a Brussels-based historian and journalist who writes mainly about urbanism. Credits: Photos by Laurent Vermeersch. The street forms the basis of our urban existence. Unfortunately mobility seems to be the only driving force behind the design of many of our streets which upsets the balance of the space http://goo.gl/kB6Vb This action in Brussels shows citizens concern, which is a very good starting point, as it implies users involvement -a must for proper street design. 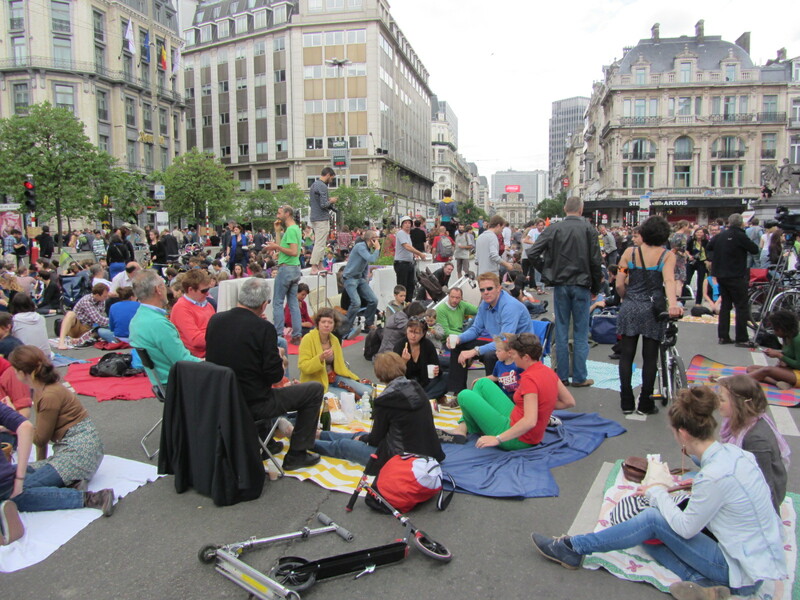 (You may want to read this article of mine about the importance of the street as a public space http://goo.gl/46zjI). I visited Brussels for the first time in 10 years last month and was struck by how unfriendly the city was for pedestrians. Cyclists seems to be pushed onto pavements by poor cycle route design and heavy traffic. Many public spaces including the square show in the article were dominated by car traffic. Despite a good public transport system many residents still seemed to be hooked on their private car use - are the politicians and officials too important to use it? I spent some time in Sheffield earlier this year and was struck by how nice it was to be in a city dominated by pedestrian traffic and supported by a good tram network. Sheffield is a far less affluent place but has managed to create high quality public spaces. Can I suggest a hotel tax - I would have been quite happy to pay a small amount of money to be spent on public spaces and parks. And a development tax - it must be possible to get some more money from all the office developers in the European Quarter.